Herbs generally need well-drained soil and to be in a sunny place out of the wind. Some herbs will tolerate some shade, and mint does best kept well watered. If possible, site your herb garden near the kitchen. Planting herbs is best in spring and summer. To maintain the herb garden, spread round the roots some well-rotted manure or garden compost in early spring or autumn. A little pruning will help to keep a good shape to the plants, and this should be done during the late summer after flowering. Do not cut back too hard to woody stems. Many herbs grow well in pots and should be given a bigger pot once the roots reach the sides and out of the base. They will survive winter frosts better if this is done again in the autumn if necessary. Potting compost, and also grit for the herbs that like good drainage, can be purchased in bags. If planting herbs from pots into the garden, dig a hole larger than the root ball, place the plant in the hole, gather soil over the root and tread round firmly. Sage , Rosemary and Thyme may need some grit in the hole if planted in clay soil. Keep plants well watered for the first few days. Most herbs have beautiful flowers. However, to produce the best flavoured leaves and lots of them, the flowering stems should be cut off before they develop. Use herb leaves every day in cooking and salads. Look after them and they will look after you. The following twelve herbs have outstanding uses in the kitchen and if you can get skilful at growing these you will have herbs most of the year and will always be able to enhance your cooking. Basil needs to be grown on in a large pot. Place this on another upturned pot to keep it above slug level and to give it good drainage. Basil needs full sun. Place outside from June to September. Water early morning. Pick whole sprigs from each shoot to prevent flowering and encourage more leaves. Re-sow each year. Chives needs fertile soil and full sun or some shade throughout the day. It needs watering well. Coriander needs to be sown directly into the ground. Sow early, mid-season and late season. Water well. Need to re-sow each year. Dill needs to be sown directly into the ground in poor soil. Sow mid-season and late season. Water well. Re-sow each year. French Tarragon needs to stay in a large pot all its life. Change compost every April. Place pot in a sunny spot in the garden. Water well. Bring into frost-free shed for the winter and keep compost dryish. Begin watering end March.t outside in full sun after last frost. Mint prefers some shade during the day to retain moisture. Keep well watered. Pull out any rambling roots to keep plant in check. Prefers to be in the ground with its own space. Parsley prefers some shade during the day to retain moisture. Needs good fertile soil. Sow in pots from June onwards and get plants up above slug-level before planting out. Water well. Pick outer leaves. Needs replacing each year. Rosemary like full sun, well drained soil and shelter from the wind. Get plant to desired height and then, in summer only, prune back the current year’s growth, while shaping the plant. Sage likes full sun and well-drained soil. 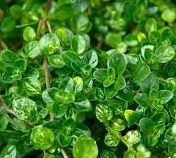 Thyme likes full sun and well-drained soil. The strip of ground by the fence in the above diagram (for Chives, Parsley, Mint) needs well-rotted compost every March. The strip by the wall (Sage, Rosemary, Thyme. Oregano, Marjoram) needs only a very little compost every March. Coriander at the front and also Dill need a minimal amount. BASIL I buy a Basil from the supermarket and I snip off the leaves to use in cooking. I water it well but it dies. I have to go and buy another one. What should I do to keep it going ? Supermarket Basil is actually lots of seeds planted close together to give the effect of a bushy plant. Like any seedlings, if you cut off their first leaves, the young plants will die. (Supermarkets like you to buy another one !) Sow your own seed (one seed per small pot and then pot it on to a larger pot) and you will have lots and lots of leaves for your salads and tomato dishes. You can harvest off your big plant until the end of October. CORIANDER If I buy a Coriander plant, it shoots up into a flower and there are not many leaves to pick. What should I do to get lots of Coriander leaf ? Coriander is an annual so will always try to flower in its first year, especially if sown before the longest day. If you love to have lots of Coriander leaves for your cooking and salads, it is best to grow a short row of Coriander seeds every three weeks from May until the end of August, directly into the ground or about 10 seeds in a large deep pot. Pick and eat your Coriander from this pot. Never try to sow first in a small pot and then try to pot on to a bigger pot. This disturbance will cause it to bolt into flower. Coriander also needs constant watering to discourage it from going to flower. Sowing like this every few weeks will give you a continual supply of leaves. Also, the later you sow the seeds, the better it stays at the leaf stage. From an August sowing you can have leaves to eat in November. Coriander is a hardier plant than most people think. For very best crop – sow late and grow thickly in a row like a vegetable into pre-prepared fertile soil. Note that Coriander can be grown in a pot – but make sure you choose a large and deep one for the roots to go down. Sow seeds direct and quite deep and sow late. Do not disturb the roots, keep watered to maintain growth, and harvest from the pot. Plant another such pot a month later. FRENCH TARRAGON My French Tarragon didn’t survive the winter. Is there any way of keeping it going ? Put it in a larger pot, and keep it in a pot always, outside in the sun in the summer. In October it will start its winter dormancy. Put the pot in a cool but frost-free place such as a garage, shed or unheated conservatory. It needs ventilation but does not need light as there are no leaves showing in the winter. Leave the compost to go very dry – not completely dried out , but still very dry. Start watering again gradually at the end of March, but do not bring the plant into the warmth. Harden off gradually and put the pot outside again at the end of May. Continue to feed and water. PARSLEY I have tried growing Parsley from seed and it doesn’t seem to come up. What’s the trick ? Parsley can take up to 3 weeks to germinate. The compost in the pot or the ground has to be kept moist in all this time. Also it sometimes happens that the seed does in fact germinate and the first leaves appear – only to be eaten immediately by slugs. Sow your seeds in small pots – a very few seeds per pot – and keep the pots away from slugs. Also do not sow too early. Sow from the end of May to August. Remember that temperature is everything (including night-time temperature) and you will get good germination if you wait until at least the end of May before sowing. Always pot on your Parsley plant to a larger pot (or preferably plant it out in the ground) as soon as the roots fill the pot. Parsley is a plant that wants to form a deep root. If you delay potting on, or planting out, the plant never catches up and the leaves tend to go yellow. Parsley likes to have regular watering, and can be placed in a position of some shade / some sun throughout the day. Harvest outer leaves by snipping lower part of stem with scissors. The stalk is as nutritious as the leaf. You can pick until the following spring! MINT Why did my Mint do really well the first year and the following year it died / didn’t have many leaves ? Mint roots are hungry and go to the edge of the pot looking for food. If kept in the same pot without any attention, the plant eventually starves to death. Put your Mint into a large pot and water it well. Every October, take the whole plant out of the pot and cut off a third of the root ball. Put the two-thirds bit back in the middle of the pot with fresh compost round. Water to settle the roots. Your Mint will keep going for ever. Sometimes people think that sinking a pot of Mint into the ground is a good way to prevent Mint from travelling. Any Mint in a pot will still need maintaining as above.